Ok, friends, while you won't catch me waiting in line at midnight for a big screen TV (because, honestly, I am too damn tired for that kind of shopping), I will absolutely be checking in on a few items that I either love and want to stock up on or have had my eye on but couldn't justify the price tag. I'll be the first to admit that I like nice things but I also don't really love to pay full price, hence my love of Old Navy! I'm breaking my wish list up for everyone in my family and I've definitely covered items we need (hello, ComoTomo bottles), want, wear and would love to wrap up and put under the tree. Let's start with yours truly, shall we? My go to investment denim, I cannot recommend this pair and wash enough. The pair I have is sadly a bit small after baby number 2 so I'm snagging a new, fresh pair for my new, fresh thighs. I picked up a sample size of the Tartiest Matte Lip Paint for my Sephora birthday gift and am in loooove. It's not drying and looks amazing on but it's a little pricey for a lip gloss that will live in the bottom of my diaper bag - fingers crossed for a good sale price! I mean, do I even have to say it? I have this tunic in white, wear it constantly (even when I was preggo) and need it in every color. I recommend it to all of my friends and no one has even been disappointed. I'm a recent convert to Zella leggings and I'll never look back. I bought my first pair of the high rise leggings during this year's Nordstrom sale and I'll be back for the moto pair that is already marked down 40%. Update: on sale for $36! If you love the gold pendant necklace that I wear pretty much every day but don't wait to wait for personalization (mine is monogrammed), this is a really gorgeous option. I'll say it: I need new bras. I honestly think new bras should be a freebie given out at your six week post partum check up, but what do I know? I have a bra from ThirdLove (and did the online sizing, which worked perfectly) and am impressed with the quality so I'm going back for a strapless and t-shirt bra in my new size. I will never have enough Shape Tape. I'm fairly certain it's the only reason I look even remotely alive after six months straight of no sleep. This one is for my best friend, Megan, who loved this sweater so hard when she saw me wear it in Charlotte on our girl's weekend. I'm hopeful it will go on sale for Black Friday and if it does, she'll grab the cream and I'll double down on the grey. I own this tee in white and reach for it constantly - it's crazy flattering and layers super well so I'll snag another color it the price is right. Update: on sale for $18! And now for my babes, Georgia is up first because she is rapidly growing and oh, so hard to please. So, I hear amazing things about this Activity Center but I think the price is a little shocking. It does grow with baby but this is a sale only item for me. Baby girl will love being upright and I'll love that she's off the floor and out from under her brother's feet. 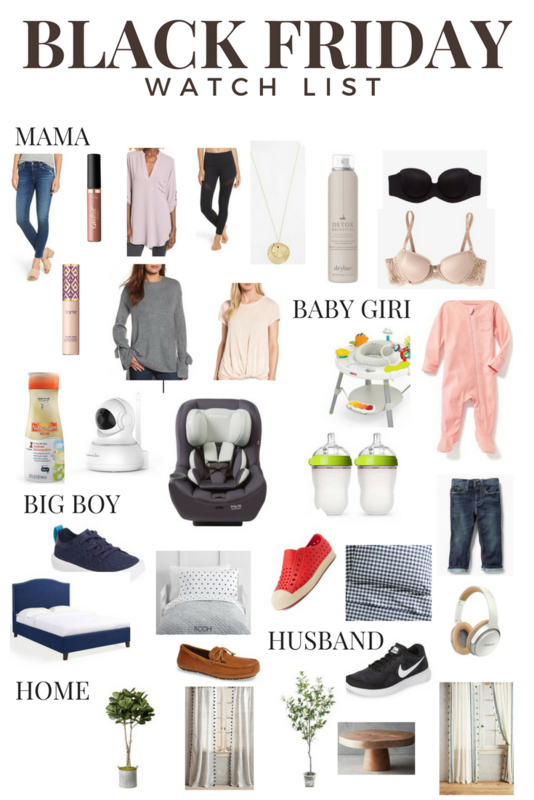 These are our go to sleepers thanks to the zipper and the price - they are already marked down 50% so we'll see how low they go! Our baby is on Nutramigen, which retails for roughly $40 a can so when an email advertising an Enfamil black friday sale popped into my inbox, I made a move. Buy one case, get one half off works for us! I just saw this monitor in action at Megan's house and we will be snagging this. The picture is so crazy clear and it can be converted into a security camera when baby outgrows it. This is our go to convertible car seat and, while it'll be a few months before baby girls needs hers, I don't want to pay full price for one. Update: a reader sent me this listing for the "blue base" color family for $141! She wouldn't be my daughter if she didn't love the ComoTomo bottles - I hope to do a full review of them soon but let's just say we only own two and we wash them over and over again, even in the middle of night, instead of using another brand. She's committed and so are we. There's a big boy room in the works and this navy bed was sent to me by a reader/friend....and you'll never believe where it's from! We have a queen mattress ready for him so this will be the start of his new nest. We rock Natives all year long because he can put them on himself, they're comfy and they handle anything he throws at him. We've owned red, navy, neon green and Clemson orange and have no plans to quit. And, so that we don't have to wear the regular Natives with socks underneath, I'll be snagging the sneaker pair and putting them under the tree. My kiddo is long and lean and we have great luck with Old Navy jeans - this pair is already marked down 50% so I'll snag a few while I'm grabbing the baby's sleepers. Big boy room, part two! Navy and white gingham sheets for the win - classic and the perfect match for that navy bed. And a monogrammed striped seersucker quilt, because I can't help myself. This is a little inside joke between us because he's always saying he needs headphones to hold Georgia during her witching hours and honestly, if you're going to rock headphones, they better be Beats. I noticied that his current pair of mocs were losing the little nubby things on the soles so I'd say it's time for an upgrade. He can wear these to work so they are for sure a win. Everyone's doing the faux indoor tree and I'm feeling a little left out. I'm really digging the faux Olive Tree because it's something a little different but if the sale price doesn't cut it, the Fiddle is the winner. Curtains are so dang pricey - but I have my eye on both of these sets for our house. If they don't go on major sale, I'll pass but I'm really, really hopeful I'll get lucky! I'm trying to copy my friends Elise and Hope with this one - I've been searching for a wooden stand to put next to my kitchen sink to hold soaps, sponges etc and I love the look of this one! If I find any can't miss deals, I pop them into my stories for you guys so be sure to follow along on Instagram!